Other Clinical Support services available on site include Oncology, Laboratory, Pharmacy, Physiotherapy and Audiology. Download "Other Clinical Support services available on site include Oncology, Laboratory, Pharmacy, Physiotherapy and Audiology." 2 for effective clinical governance with implementation of appropriate actions to prevent recurrences in order to improve quality and safety for patients, visitors and staff. There are external reporting requirements for Healthcare Improvement Scotland (HIS) private medical insurance companies and the general public. There has also been ongoing progress on the project to collect and publish comparative data to assist patients and referrers with their choices on healthcare facility. This has started with the launch of an independent Private Healthcare Information Network (website which provides information on our facilities and variety of procedures carried out and quality indicators. The range of the available indicators will continue to grow for ongoing enhancement of choice. Infection prevention and control The focus on infection prevention and control continues under the leadership of the Corporate Head of Infection Prevention and Control, in liaison with the Infection Prevention and Control link nurse in Albyn Hospital. We have had: no cases of MRSA bacteraemia in the last year and no cases of hospital apportioned Clostridium Difficile in the last 12 months. We carry out regular Infection Prevention and Control audits which include surgical site surveillance, environmental environmental what?, safe disposal of sharps and clinical waste. 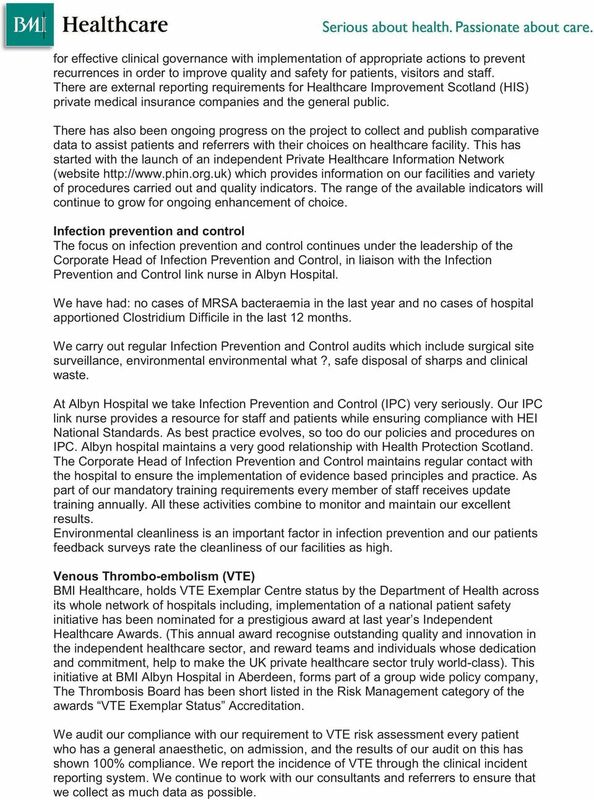 At Albyn Hospital we take Infection Prevention and Control (IPC) very seriously. Our IPC link nurse provides a resource for staff and patients while ensuring compliance with HEI National Standards. As best practice evolves, so too do our policies and procedures on IPC. 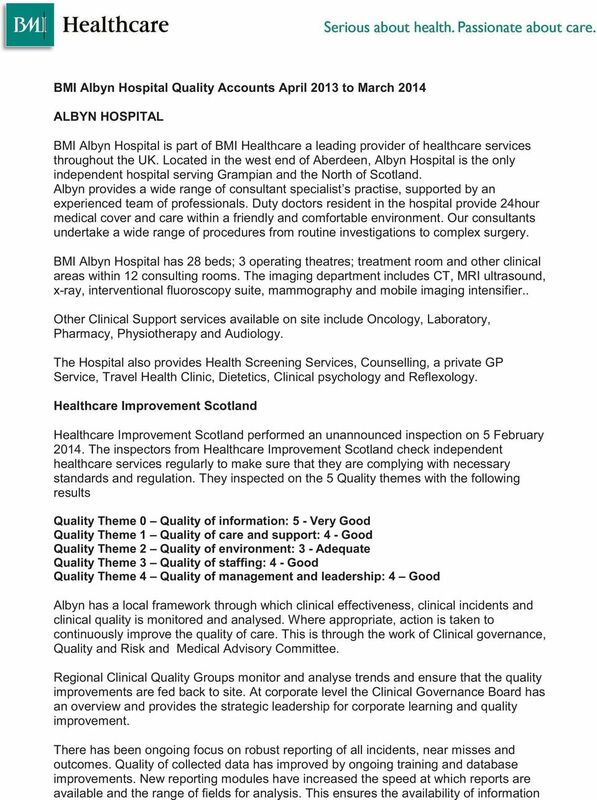 Albyn hospital maintains a very good relationship with Health Protection Scotland. The Corporate Head of Infection Prevention and Control maintains regular contact with the hospital to ensure the implementation of evidence based principles and practice. As part of our mandatory training requirements every member of staff receives update training annually. All these activities combine to monitor and maintain our excellent results. Environmental cleanliness is an important factor in infection prevention and our patients feedback surveys rate the cleanliness of our facilities as high. Venous Thrombo-embolism (VTE) BMI Healthcare, holds VTE Exemplar Centre status by the Department of Health across its whole network of hospitals including, implementation of a national patient safety initiative has been nominated for a prestigious award at last year s Independent Healthcare Awards. (This annual award recognise outstanding quality and innovation in the independent healthcare sector, and reward teams and individuals whose dedication and commitment, help to make the UK private healthcare sector truly world-class). This initiative at BMI Albyn Hospital in Aberdeen, forms part of a group wide policy company, The Thrombosis Board has been short listed in the Risk Management category of the awards VTE Exemplar Status Accreditation. We audit our compliance with our requirement to VTE risk assessment every patient who has a general anaesthetic, on admission, and the results of our audit on this has shown 100% compliance. We report the incidence of VTE through the clinical incident reporting system. We continue to work with our consultants and referrers to ensure that we collect as much data as possible. 3 Enhanced Recovery Programme (ERP) We are currently developing the ERP programme to our hospital. ERP patient outcome allows us to improve postoperative recovery. The main focus is ensuring patients receive the correct information at the correct time to enhance their recovery. 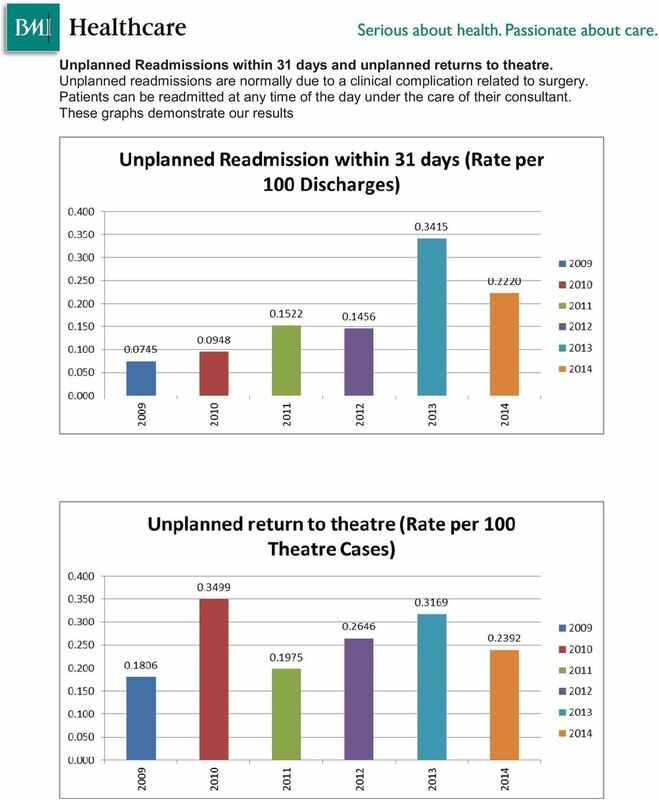 This is an evidencebased model of care that creates fitter patients who recover faster from major surgery. 5 Patient satisfaction Our staff are dedicated to providing the highest standard of care to all of our patients. We continually monitor how we are performing by asking inpatients and outpatients to complete a satisfaction questionnaire. These surveys are administered by an independent third party. 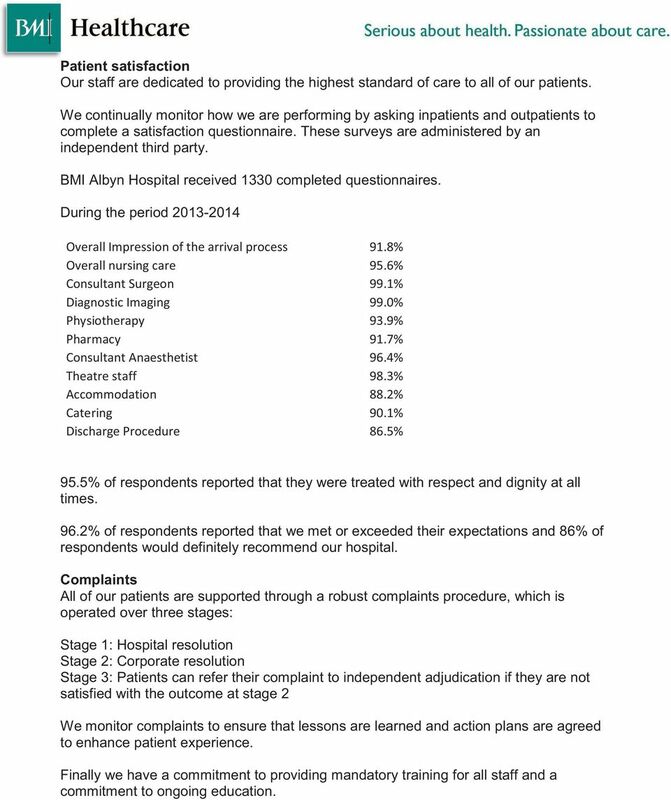 BMI Albyn Hospital received 1330 completed questionnaires. During the period % of respondents reported that they were treated with respect and dignity at all times. 96.2% of respondents reported that we met or exceeded their expectations and 86% of respondents would definitely recommend our hospital. Complaints All of our patients are supported through a robust complaints procedure, which is operated over three stages: Stage 1: Hospital resolution Stage 2: Corporate resolution Stage 3: Patients can refer their complaint to independent adjudication if they are not satisfied with the outcome at stage 2 We monitor complaints to ensure that lessons are learned and action plans are agreed to enhance patient experience. Finally we have a commitment to providing mandatory training for all staff and a commitment to ongoing education.